We live in a world which surrounds us with mathematics and mathematicians. We use mathematics constantly in our everyday lives, therefore we must support our students to be mathematical thinkers so that they can be true citizens of the world. This can be accomplished in an environment that fosters self confidence and excitement about mathematics. Students will be provided with hands on experiences that allow for discovery and risk taking. These experiences promote the ability to reason, use appropriate tools and technology, and to develop a variety of problem solving strategies. As teachers, we are committed to the belief that any given problem can be approached and solved using a variety of strategies. Understanding the level of learners and their achievement is important to the success of the classroom. learning. Students will be able to communicate about mathematics orally, in writing, and by using pictures, diagrams, and models. Students’ problem solving skills will be enhanced through a conceptual approach to teaching mathematics which will allow them the capacity to apply their learning to unique situations and to articulate their understanding of the process. Students will learn mathematics through a discovery approach to ensure that they are thinking deeply about concepts. For this process to succeed, teachers will establish multiple entry points and embed differentiated questioning into tasks and activities. Sixth Grade Mathematics is about connecting ratio and rate to whole number multiplication and division and using concepts of ratio and rate to solve problems. Students will also strive to achieve a complete understanding of division of fractions. They will extend their notion of number fields to include the system of rational numbers, which means negative numbers. Writing, interpreting, and using expressions and equations will have a greater emphasis and developing students’ understanding of statistics will be a further goal. Seventh Grade Mathematics is about developing an understanding of proportional relationships and applying these concepts to real world activities. We will further develop an understanding of operations with rational numbers and working will incorporate expressions and linear equations. Solving problems involving scale drawings and informal geometric constructions, and working with two- and three-dimensional shapes to solve problems will also feature. This work will include area, surface area, and volume. Finally we will draw inferences about populations based on samples. Eighth Grade Mathematics is about formulating and reasoning with expressions and equations. Students will also model situations using bivariate data and linear regression. This course includes solving linear equations and systems of linear equations as well as grasping the concept of a function and using functions to describe relationships. Students will also analyze two- and three-dimensional space and figures using distance, angle, similarity, and congruence. Finally students will gain an understanding of the Pythagorean Theorem and will apply this theory to unique situations. 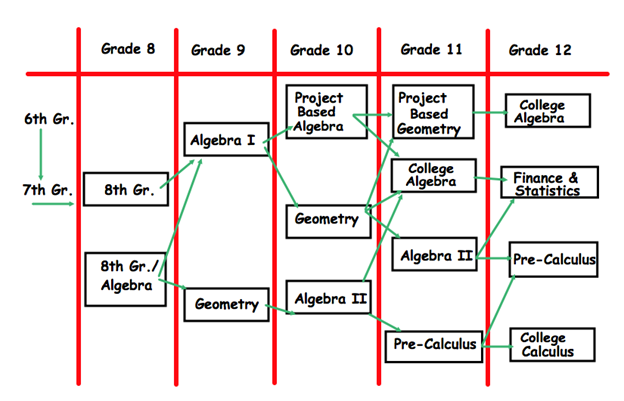 This will also be the first opportunity for students to branch off into a different mathematical pathway and be part of the group of students that study both grade 8 mathematics and Algebra I.
Algebra I: The fundamental purpose of this course is to formalize and extend the mathematics that students learned in the middle grades. The units of work will deepen and extend students’ understanding of linear and exponential relationships by contrasting them with each other and by applying linear models to data that exhibit a linear trend. Students will engage in methods for analyzing, solving, and using quadratic functions. The course will place a large focus on students engaging in rich problem solving tasks. They will collect artifacts from this process to establish a portfolio which will help prepare them for the challenges of their main consortium task in grade 11. Geometry: The fundamental purpose of the course in Geometry is to formalize and extend students’ geometric experiences from the middle grades. Students explore more complex geometric situations and deepen their explanations of geometric relationships, moving towards formal mathematical proofs. Students will look at congruence in terms of frigid motion and connect this to their knowledge of transformations. They will also be introduced to trigonometry, similarity and the geometric properties of equations. The course will place a large focus on students engaging in rich problem solving tasks. They will collect artifacts from this process to establish a portfolio which will help prepare them for the challenges of their main consortium task in grade 11. Algebra II: This course will build on students’ work and understanding with linear, quadratic, and exponential functions. Students extend their repertoire of functions to include polynomial, rational, and radical functions. Students will work closely with the expressions that define the functions, and continue to expand and hone their abilities to model situations and to solve equations, including solving quadratic equations over the set of complex numbers and solving exponential equations using the properties of logarithms. The course will place a large focus on students engaging in rich problem solving tasks. They will collect artifacts from this process to establish a portfolio which will help prepare them for the challenges of their main consortium task. Pre-Calculus: We will extend students’ understanding of complex numbers to points in the complex plane. Students will gain an understanding that multiplying a given set of points by a complex number amounts to rotating and dilating those points in the complex plane about zero. Matrices will be studied as tools for performing rotations and reflections of the coordinate plane, as well as for solving systems of linear equations. Inverse functions will be explored as students study the relationship between exponential and logarithmic functions and restrict the domain of the trigonometric functions to allow for their inverses. The final major emphasis will be on probability distributions. The course will place a large focus on students engaging in rich problem solving tasks and to connecting their learning to real work situations.